Nearly every year it makes its appearance for just a day or two: snowfall in the Carolinas. 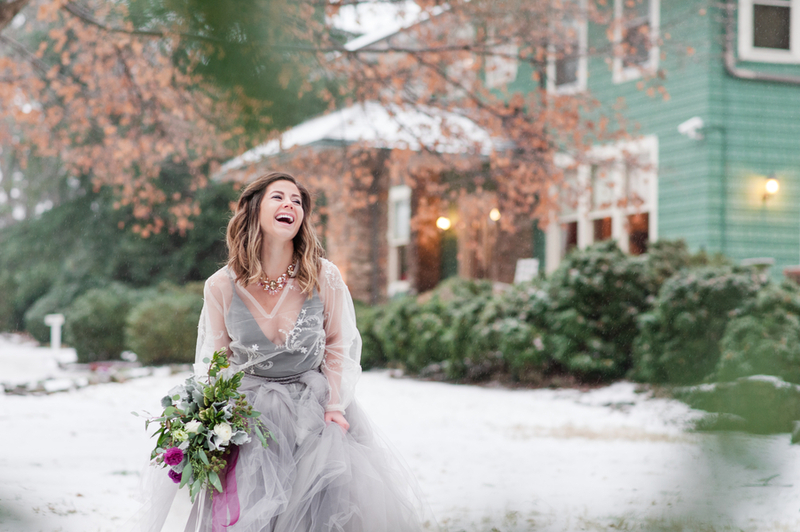 With it comes a flurry of excitement as Charlottean wedding vendors brave the icy roads and blustery winds to create pure magic. Temperatures drop and inspiration surely culminates. This once-in-a-winter opportunity even led to a bit of wakefulness, Lee divulges. “I was up about TEN times that night checking outside to see if we had enough snow! 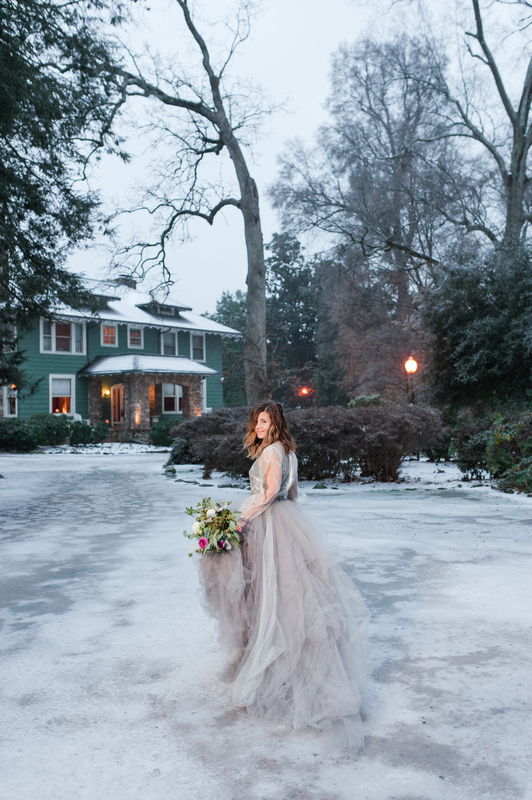 We got up early in the morning to capture the quiet and calm of the lamp lights… Just at the end of our shoot it began to snow, and we were able to get a few photos with falling snow,” she says. The resulting photos are simply sublime. 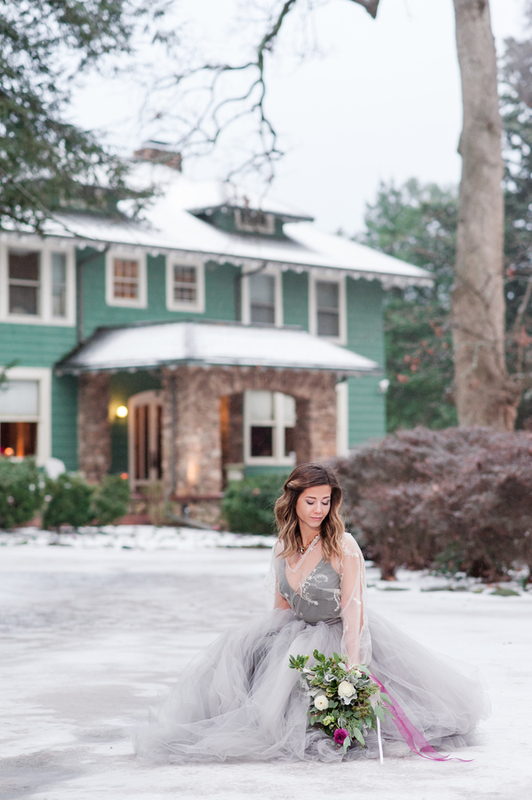 Plaza Midwood’s VanLandingham Estate, of course, proved itself the ideal setting for a snow scene and, as per always, perfect for portraiture. Against the backdrop of its historic Harwood Home, among the meticulously manicured topiaries, beside the reticent frozen fountains, and within a labyrinth of towering hedges lies its poetry. It’s no surprise that this fully functioning inn and event space is recognized on the National Register of Historic Places and rightfully considered among the finest of lodging in Charlotte. 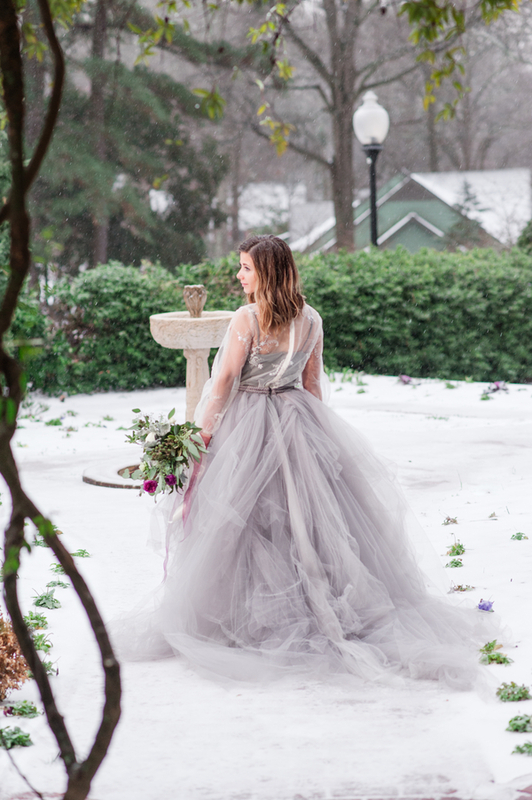 Local designer, Erin Foley of RCB fashion, conceptualized and crafted this devastatingly beautiful tulle ensemble right here in the Queen City. From its tonal gray hues to the double plaited belt, nothing about this frock is ordinary. The bodice flaunts an alluringly deep V-neck as layered beneath an embroidered organza top with split sleeves which are finished in romantic belled cuffs. As for first impressions? 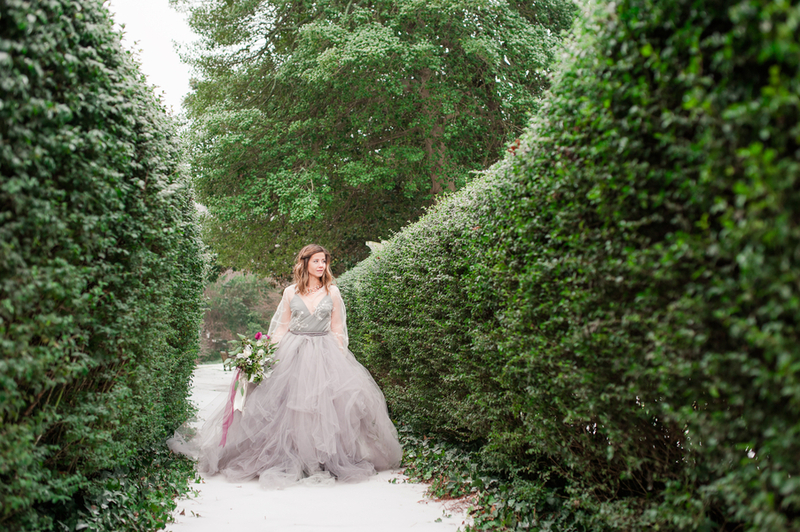 Lee exclaims, “I was absolutely FLOORED by her stunning dresses! Erin gave me this jaw dropping gown that she made in her down time that hadn’t been shot before. 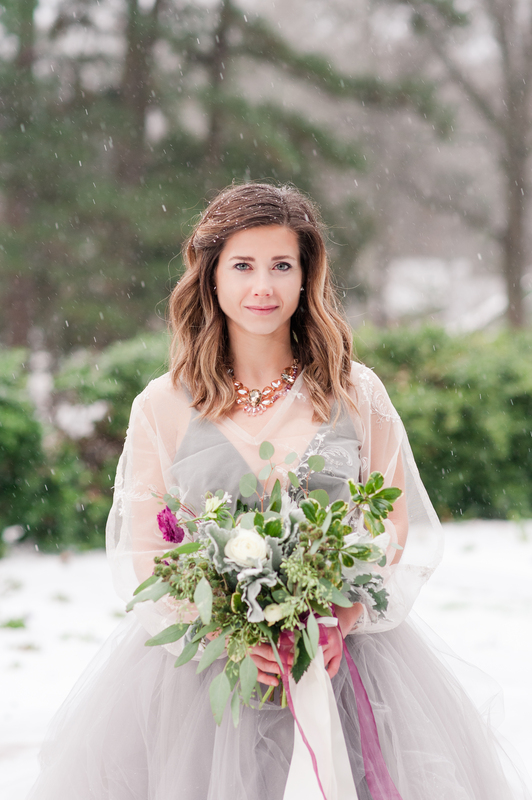 The dress couldn’t have been more perfect!” We very much agree. And the florals? For being arranged on such short notice, one surely wouldn’t know it. Eye-catching dusty miller, boughs of green brunia, and sprays of seeded eucalyptus provide a foundation of greenery that’s both texture rich and current. Throughout the hand tied bouquet, lush crème and fuchsia ranunculus are interspersed to carefully coordinate with wide silk streamers and sheer organza ribbons.